A method is proposed for obtaining information about the light distribution in an optical image. 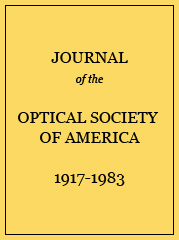 The characteristic function of the optical system is approximated by a polynomial, containing terms up to the fifth or seventh order. The coefficients of this function having been found, a large number (about 100) of rays from an object point are chosen, so that they are evenly spaced in the aperture of the system. By means of the function, the intersection points of the rays can be calculated in any desired image plane, to a close approximation. The intersection points were plotted, representing each ray by a small dot. The figures show that these plots are very similar to photographs of the image of a point light source. The image of a line element can be obtained by integration of a series of such figures.